A reader's Asbestos question: Asbestos siding painting? Robert K. from Horsham, United States had this Asbestos siding painting question. 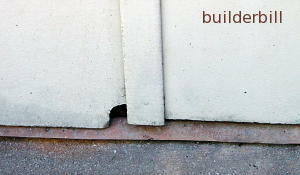 Following on from the question about asbestos siding cleaning I have added this extra few tips on painting the siding. Asbestos siding painting - Glue back in place with gap filler. Asbestos siding painting - Fill up with gap filler. Asbestos siding painting - Replace with a new timber batten. To steal a line from the real estate industry, the three most important things in painting are "Preparation, Preparation and Preparation". I have written about asbestos siding cleaning, and after the washing down is finished there is still more to do before we actually get to the painting itself. You need to fill up any cracks, damaged areas and slightly open joints. The reason is twofold, first the whole idea of painting is to provide protection from water ingress, to stop further deterioration and second and less import is to make it look good. Buy a good caulking gun and at least one box of white acrylic sealer filler compound. also you will need a good cloth, a bucket of water and a good flexible painter's scraper - putty knife. 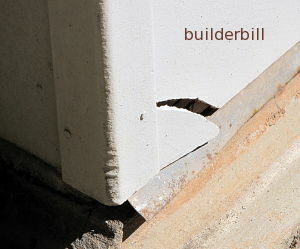 Whatever type of siding that you have, it is 100% sure that there will be joints in it that would benefit from a touch of filler. In the case asbestos cement cover battens I would run a bead of filler down each side, irrespective of whether the joints were tight or not. The filler is a good flexible medium that not only fills, but once it is dry it grips as well. This stops those small cracked pieces at the ends of battens eventually falling off. If there are any loose or raised nail heads tap them in with a hammer or if they are still not solid smear a touch of filler over them. With a broken piece like in the photo at the top right I would squeeze filler into the gap and then press or tap the piece back into position. Wiping off the excess with a paint scraper. The piece should stay in position, but if it doesn't don,t nail it. Hold it in position with tape or a wedge etc. until the filler has gripped. In the case of the middle photo, fill the hole and smooth it with the paint scraper. I would also run a bead of sealer under the bottom edge of the sheets. The bottom photo shows a batten that has been repaired (?). In a case like this, remove it and replace with a timber batten of a standard size, say 40mm x 12mm. Use safety gear when removing old battens, bag the pieces and dispose of them correctly. Any new battens I would prime the back first before fixing them. You will find that time spent doing filling work will not only give you a better job by holding potentially loose pieces, but the finished job will look better. As a bonus you will save time when painting by not having to continually go back and dab in more paint into open joints. A couple of paint manufacturers here in Australia produce top class premier acrylic exterior grade paint products that are advertised as "no primer required". That is, the paint can be applied directly to most clean building surfaces. Wood, cement based products and most metals without using a primer. This type of paint is excellent for asbestos siding painting. If possible use the paint directly as it comes out of the tin, no water added. Get 20 litre drums and use a good mixer in a slow speed electric drill if possible, or take your time and do a thorough job with a hand mixer. The first coat may have a touch of water added, but don't overdo it. Definitely no more than 10%. Some people and a lot of commercial painting contractors advocate the use of an airless spray gun, but I certainly disagree with their use for small one off projects. In my experience they soak up a lot of time in preparation work like masking, but the times that I have hired airless sprays we used a lot more paint than if we had done the job by hand. There is a considerable amount of skill required to use an airless correctly. I use a good quality 75mm cutting in brush and 20mm x 270mm lambs wool roller. My old mate Holmsey who was a commercial painter all his working life told me years ago to get a a heavier and better quality roller cover for jobs like this. Just because the surface is smooth and a 10mm or 15mm foam cover will do the job, that does not mean that it is the best tool for the job. Get a good roller that can hold a good amount of paint and roll it out. That way you spend more time painting the surface and less time up and down with the thing. A good quality roller extension handle is an asset too. For stiffness and control, the aluminium extension ones that the tradies use are far better than the cheap wooden things. Do at least two coats and possibly three.